ADJ’s new Ultra Bar Series - a professional grade of indoor linear fixtures - now offers lighting designers and entertainers a brighter 3W TRI color (3-IN-1) RGB LEDs at breakthrough prices similar to existing 10mm LED linear fixtures on the market today. The Ultra Bar Series consists of three models: Ultra Bar 6, a 1/2-meter (22.5 inch) linear bar with six 3W TRI LEDs, Ultra Bar 9, 1-meter (41.75-inch) linear bar with nine 3W TRI LEDs, and the Ultra Bar 12, 1-meter (41.75-inch) linear bar utilizing twelve 3W TRI LEDs. Its TRI color LED engines offers vibrant, fluid color mixing, resulting in stunning slow color fades or fast, high-energy color changing modes; ideal for color washing and uplighting night clubs, performance stages, churches, as well as retail spaces like restaurants. The Ultra Bar Series features advanced Pixel Control capabilities. The Ultra Bar 6 and Ultra Bar 9 offers the option to control three different sections of its bar, while the Ultra Bar 12 has an option to control three or six sections. The Ultra Bars have a special DMX mode that accepts a signal from ADJ’s EZ-Kling converter box (sold separately) to run Kling-Net protocol via Arkaos’ Media Master Express or Media Master Pro software (sold separately). Kling-Net distributes video data to the Ultra Bars transforming them into low resolution video panels. These features allow designers advanced programming and more freedom of expression in light. Each of the fixtures have a 40-degree beam angle, 6 operational modes (Auto Run, Program, Sound Active, RGB Dimmer, Static and DMX), offer 0-100% electronic dimming, strobing and flicker free operation, and ADJ’s unique, patent pending, Quick Align magnetic end locking system that allows multiple fixtures to be connected together for a seamless output of light with no breaks in uplighting. Plus, it offers flexible programming from its on-board 4-Button LED DMX menu, or by using a DMX board or ADJ’s RFC RF wireless remote (sold separately). 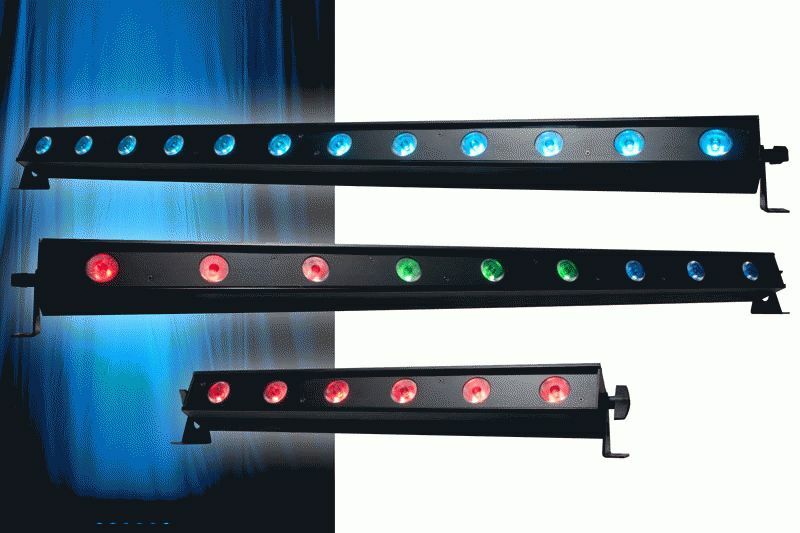 Ultra Bar 6 - A 22.5-inch (.5 meter) Linear fixture with 6x 3W bright TRI (RGB: 3-IN-1) LEDs, 7 DMX channel modes, 3-Section Pixel Control, 35 built-in color macros, DMX In/Out, IEC power In/Out and multi-voltage operation (AC 100V-240V, 50/60Hz), and has a maximum power draw of only 22W. The Ultra Bar 6 measures in at : 22.5” x 2.5” x 3.75”/ 560 x 63 x 90mm (LxWxH) and weighs only 4 lbs./ 1.6 kg. Ultra Bar 9 - A 41.75-inch (1-meter) Linear fixture with 9x 3W bright TRI (RGB: 3-IN-1) LEDs, 7 DMX channel modes, 3 or 6-Section Pixel Control, 35 built-in color macros, DMX In/Out, IEC power In/Out and multi-voltage operation (AC 100V-240V, 50/60Hz), and has a maximum power draw of only 35W. The Ultra Bar 9 measures in at : 41.75” x 2.5” x 3.5”/ 560 x 63 x 90mm (LxWxH) and weighs just 6 lbs./ 2.6 kg. Ultra Bar 12 - A 41.75-inch (1-meter) Linear fixture with 12x 3W bright TRI (RGB: 3-IN-1) LEDs, 9 DMX channel modes, 3-Section Pixel Control, 35 built-in color macros, DMX In/Out, IEC power In/Out and multi-voltage operation (AC 100V-240V, 50/60Hz), and has a maximum power draw of only 43W. The Ultra Bar 9 measures in at : 41.75” x 2.5” x 3.5”/ 560 x 63 x 90mm (LxWxH) and weighs just 6 lbs./ 2.6 kg.